This month, I had the chance to visit and follow up with a new 3D Printing business in my local area, Intermountain 3D, owned and operated by long-time friends and fellow HP alums Lynn and Brian Hoffmann. And I want to again share a little of what I have been learning recently about the nascent business of 3D printing, aka “additive manufacturing,” with this month’s version made possible via great insights from the Hoffmanns. And OK - if you read my January Observations you know I am in the middle of what I believe to be a long-overdue sabbatical, which includes — in part — taking myself off the hook for a monthly “Observations” post. But part of a sabbatical is having time to explore and learn about different areas of interest, and yes, for me at least, that means making and sharing observations! My explorations in this case includes getting a bit closer to the hands-on side of 3D printing, as opposed to my normal higher-level business strategy approach (for example, see my recent review of HP’s history in the 3D printing market). This month I continued by visiting with a pair of long-time HP colleagues who are a husband-and-wife team bringing many years of experience in engineering, marketing, and general management. Brian Hoffmann, serving as the new company’s president, is an HP R&D and engineering veteran who left the company a couple of years ago. Lynn Hoffmann, Intermountain 3D’s CEO, has experience concentrated more on marketing and general management; like Brian (and me), mostly in the printing and imaging world. Their new business started at the end of 2014 is focused on serving the greater Boise market as both a 3D printing service bureau as well as sales representatives for current world market leader 3D Systems (ticker symbol DDD). With equipment sales opportunities spanning not only Idaho but also Wyoming and Montana, they are understandably excited about the challenge and opportunity. In comparing their startup firm, Intermountain 3D, to others around the country, they know that their portfolio of skills and experience is a strong asset. They note that other peer companies that market the DDD product line are, in many cases, existing firms that either have specialized in other machine tools and basic prototyping and low-volume, specialized manufacturing, or are familiar design and drafting companies who see 3D printing as an extension of their capabilities. A visit to their business in recent weeks proved both impressive and instructive. As we have so often heard from printing industry veterans, “3D printing is not REALLY printing,” but there are commonalities I am fascinated by, and the Hoffmanns agree. Noting their long tenure in HP’s printing business, Lynn began by recalling their certification process with 3D Systems. As their trainer described the familiar basics of the 3D printing market, including technologies that are laser-based and inkjet-based, they began to feel themselves on fairly familiar ground. Any big surprises so far? Those HP backgrounds, for the most part, are of great utility so far. Working mostly on the back-end of market and product strategy, design, and fairly high-level planning, even with a current product line, is quite a contrast to working squarely on the front-end, says Lynn, in the ultimate “feet on the ground” marketing and sales role. And while the concept of selling has always been important, actually making it happen brings its own challenges. And what about HP in 3D Printing? Bringing to mind the “Welcome IBM, Seriously” message from Steve Jobs at the time of the original IBM PC launch, she concludes, “The history is there, and us being involved could be an interesting play. We like that it’s a homegrown technology, and not an acquisition. We are encouraged by this.” Spoken by a true old-school HPer, and I should know!!! 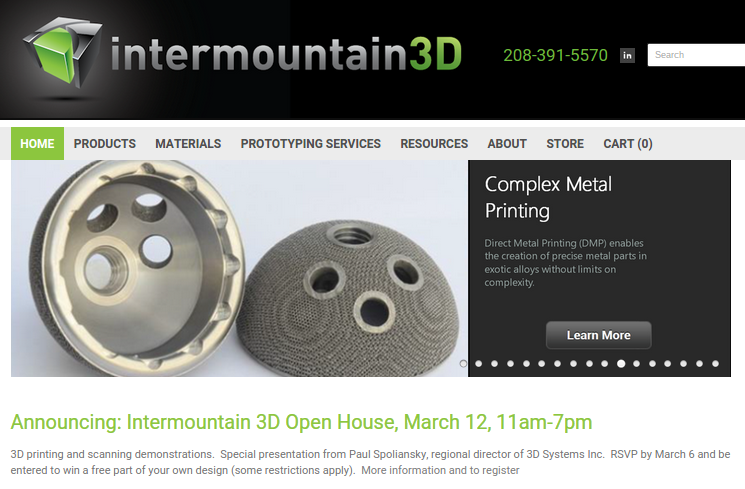 Best wishes and thanks to Brian and Lynn Hoffmann, and for those readers in the local Boise area, Intermountain 3D is having a grand opening open house on March 12. And the local Boise newspaper, The Idaho Statesman, did a nice basic write-up (see "Printing in Three Directions" ) on the Hoffmanns and their business in between my visit and press time for this post. 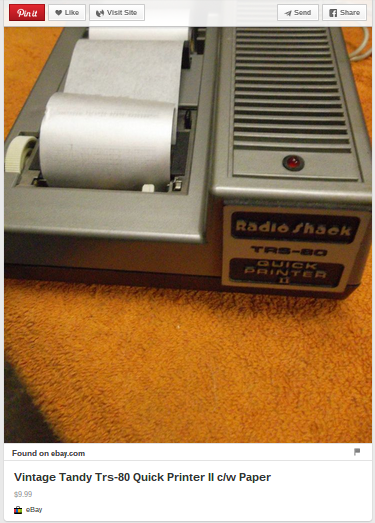 This week, there has been an interesting outpouring of nostalgia regarding the final days of Radio Shack. One of my favorites is by David Pierce in Wired, How RadioShack Helped Build Silicon Valley. Obviously Radio Shack has, among other proponents, lots of baby boomers who can track their relationships with the stores (and catalog) to their childhoods. There are also younger aficionados (lots of memories these days of "learning to program on Dad's TRS-80" and the like), and I can remember my own original TRS-80's final days (after having survived two cross-country moves), when my curious youngest son, during his childhood, "took it apart to see what's inside" - with permission I might add. I believe my very first "personal printer", the QuickPrinter II (see above for example) to go along with that first personal PC, met a less memorable end. For more Radio Shack, Tandy, and "Trash-80" memories, there are some amazing websites out there, and a great Wikipedia article on the TRS-80 I recommend as a starting point.